Ever Hear About a White Athlete’s Baby-Mama Drama? The jury on whether life imitates art or vice versa will forever be hung. Celebrities and their work definitely have an impact on how individuals perceive the world. We are wowed by the exploits of athletes, croon along to the angelic voices of singers, marvel at the on-screen personas of our favorite thespians and nod our heads to the beat of hip-hop’s top lyricists and producers. But once their stardom reaches a certain point, do we continue admiring the works they produce outside the lines of their respective fields and professions? 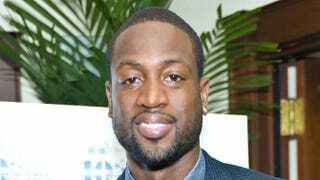 The recent revelation that the Miami Heat’s Dwyane Wade has fathered a so-called secret child outside of his relationship with actress Gabrielle Union is only the latest in a long line of instances in which athletes who were married or in a relationship found themselves having to explain a bundle of joy to their significant other and their fan base, too. In a nation filled with those whose morality is spurred more by self-righteousness and convenience than by true moral superiority, many in the media will use these circumstances as a reason to skewer and humiliate. Yes, people do build you up to bring you down. Nothing highlights that more than the modern media machine. In addition, those in the black media specifically are certain to use said circumstances to get on a soap box from which they can preach about the failing black family and the moral bankruptcy of the hip-hop generation, as if all the ills of the black community fell out of the sky in 1999. But this type of horny behavior is certainly nothing new. Former heavyweight champion Evander Holyfield, retired NBA basketball player Shawn Kemp and NFL Hall of Fame running back Marshall Faulk are often talked about like unfixed dogs whenever athletes and baby mamas hit the news. They have been the media standard-bearers for a lack of self-control for years. All of them were once young as well as gifted and black, and seemed to be indiscriminately "getting busy." However, retired NFL quarterback Brett Favre has children out of wedlock. Former Boston Celtic great Larry Bird had baby-mama drama while attending Indiana State. Brian Urlacher, formerly of the Chicago Bears, has a baby mama, along with former NFL quarterback Matt Leinart and retired NBA single-game-assist record holder Scott Skiles. But when is the last time you heard about a white dude’s baby-mama drama? And why are African-American males the only demographic taken to task whenever these issues come to light in the media? Likely because whenever black men are involved in such unsavory circumstances, it feeds into the old idea of colored men being hypersexual beasts lacking even a shred of self-control or self-respect. While images of black men being depicted in a bad light do make me cringe, I am not of the belief that every black person is representative of his or her entire race. It’s simply not a realistic way to look at the world, and hasn’t been since the end of the old Jim Crow days of the 1960s. There are more black people living in diverse environments and adhering to varied philosophies now than in any other era in the history of this country. Athletes dealing with baby-mama drama are indicative not of out-of-control black and brown men but of a culture that believes special people deserve special privileges. In America, athletes are considered to be among those “special” people. The message is often sublime and begins when said individuals are children. By the time they are adults, many professional athletes have been inundated with messages from a sports culture that has taught them that the world is theirs to conquer. The best houses, the fastest cars and any woman they see fit to have are theirs for the taking. In many instances, celebrity athletes don’t have to ask for anything. They are bombarded by opportunities—many of them sexual.